The Iridium GO! wall-mount bracket it provides the ability to install the Iridium GO! in a vehicle or building with easy removal. It includes mounting plate, wall bracket, and screws (2 wood, 2 metal). The mounting plate attaches to the Iridium GO! with the included 1/4" screw. The wall bracket attaches to wall or vehicle mount (ex. 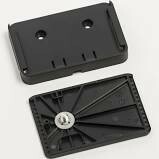 RAM mounts) with included screws or applicable screws/bolts.